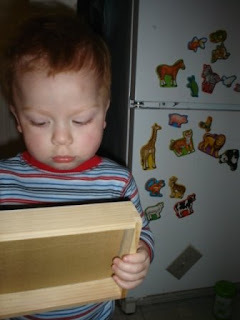 Here is Thomas figuring out his new gift from our sweet neighbors. 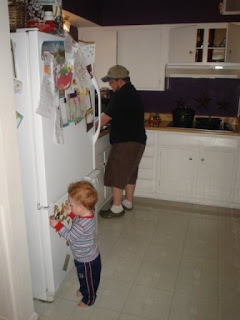 And here is Dad managing to get some work done wihtout a baby pulling his pants leg. And here is mom goofing around with her camera. Just a nice normalish day. We like those. i got such a weird look when i requested them!!! 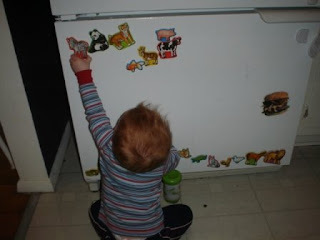 Oh how sweet it is to magnet the frig!! 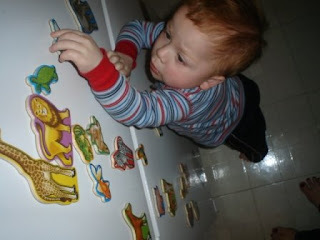 I love it.... keeps Thomas busy and gives ya'll a break. Sarah & Scott & Thomas of course, you are in my thoughts and prayers daily, sometimes even in my dreams. I love you bunches and bunches. Does Thomas still like his Light-Turtle?